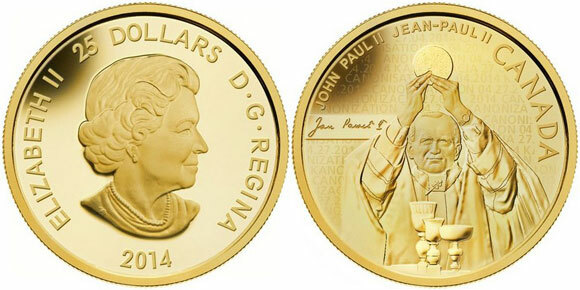 The Royal Canadian Mint has launched two new commemorative coins which honor the upcoming canonization of His Holiness, the Late Pope John Paul II, who was considered one of the most beloved pontiffs in living memory – possibly of all pontiffs in the history of the 2000 year institution. The pure gold and pure silver collector coins were unveiled at ceremonies in Mississauga, Ontario and Saguenay, Quebec as well as the Canadian Embassy in Warsaw, Poland. In 1984, Pope John Paul II became the first Pope to set foot on Canadian soil, when the papal aircraft landed at the airport in Quebec City. Already an accomplished traveler, the Pope was on his 24th pilgrimage. Wherever he went during his 12-day cross-Canada visit, great crowds flocked to him. Millions of Canadians, including many Indigenous people, turned out to greet the pontiff, pray with him and to celebrate, and many of them were deeply moved by his words and presence. Speaking in English and in French, Pope John Paul II delivered more than 30 major addresses as well as many other statements. Pope John Paul II would return to Canada twice. In September 1987, he visited Fort Simpson in the Northwest Territories. On the third and sadly, the last visit, he met with young people from around the world to celebrate World Youth Day 2002, in Toronto, Ontario. After a papal reign of just about 26 and a half years, the second longest for a pope, John Paul II died on the 2nd April 2005. John Paul II will be canonized on 27 April 2014, alongside Pope John XXIII, whose reign was between 1958 and 1963. 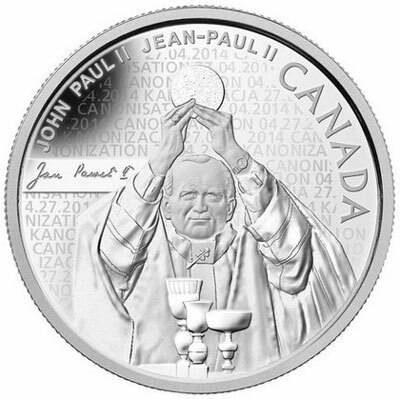 The reverse image on both coins reproduces a photograph of Pope John Paul II offering Mass during his first visit to Canada in 1984. Through the expert application of varied finishes and skilled engraving, Royal Canadian Mint engravers faithfully captured the power of the moment as the pope raises the Consecrated Host at the elevation. The obverse side features a portrait unique and distinct to the coins of Canada which was designed by Susanna Blunt and in use since 2003. For more information on this and other coins offered by the Royal Canadian Mint, please visit the new releases section of their website. Information is offered in both English & French, international orders dispatched. The coin will also be available at the Royal Canadian Mint’s boutiques in Ottawa, Winnipeg and Vancouver, as well as through the Mint’s global network of dealers and distributors, including participating Canada Post outlets.